If you're looking to kill your gaming competition, then the Killer E2100 Game Networking Platform might be for you! The Killer E2100 platform accelerates online game traffic improving the networking performance for gamers like you. Bigfoot Networks, a networking tech company and the creator of the Killer network cards, has announced at CES that ASUS will embed the Killer E2100 networking hardware into a special LAN and audio card called the ThunderBolt. Bigfoot Networks CEO Michael Howse says that the platform delivers a great combination of performance, intelligence, and control to the users. The features of the platform include accelerated traffic, bandwidth control of applications, health management of your gaming system in a graphical display, and more. 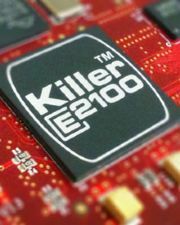 The fast networking platform is based on the Killer 2100 Network Card. The ThunderBolt is featured on the upcoming Rampage III Black Edition motherboard by ASUS and was designed on the account of feedback gathered from the PC gaming community. The new motherboard is expected to improve gaming experience by making it more rewarding and accessible. The companies will release more details on the product, including pricing and availability, in early 2011. More gaming news from PCWorld's Game On blog! Follow GeekTech on Twitter or Facebook , or subscribe to our RSS feed .